One of my original and ongoing purposes for this blog is to help me remember past trips, a digital journal that I just happen to make public. Accordingly, its not good to wait too long before recounting my trips. I'm finding that as life becomes busier, the likelihood of remembering every trip detail months later is definitely diminishing. Thus I find myself thinking back a whole week to last Sunday when I headed up to Rocky Mountain National Park to check out new water. Well, at least some new water. 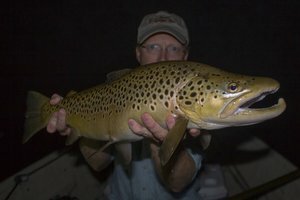 I had a BIG fish that I still needed to catch so a stop by the big brown's lair was in order early in the trip. Arriving stream side, it was obvious that someone had beat me to my spot, or nearly so, and I'm not one to jump in front of another angler. There are plenty of fish to go around so I journeyed a bit further afield, quite literally I might add, into a beautiful meadow with a winding stream full of presumably hungry trout. 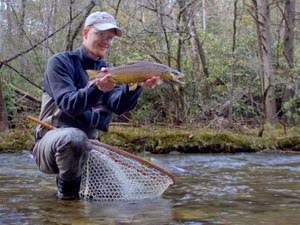 The first undercut bank I stopped by just looked fishy, and I tossed my fly into the stream, full of eager anticipation for what would hopefully happen next. Peeking over the side, I saw a nice brown examining the fly. I quickly leaned back before I spooked the fish and couldn't resist adding just a little twitch to the fly. The twitch was just the ticket and a nice brown was soon tugging on the other end of my line. Catching a fish on the first cast can be a sign of terrible luck to come so I photographed the fish in case it was not only the first but also the last of the day. Moving up the creek, I continued until reaching water that another angler had just finished with. In fact, I fished quickly up through a couple of used pools before convincing myself that it was truly wasted effort. The fish were spooked and nothing I could do would fix that. 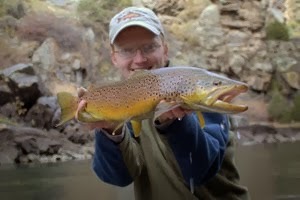 Still, in an hour or so of fishing, I had caught several very nice browns with an average size of 13-15 inches. A few small 8 inchers kept me from getting too full of myself, but some of the larger ones posed for a second before the release. Trekking back across the fields to my car, I almost thought about quitting early, but new water has a way of beckoning. Adventures should never be kept waiting too long so off I went to try another stream. This one also had a meadow section but before trying the new water I stopped to heat up some chili for lunch. This has become one of my favorite cool-cold weather fishing foods. It takes a bit longer to do a meal since I bring out the camp stove, but there's something about a hearty warm meal that is so amazing in the middle of a long day on the water. Finishing lunch, I decided on just the spot I wanted to hit. The first two pools were not very reassuring but then a small brown flashed my streamer. Where there are small browns there are also normally large browns. Moving upstream, I hit a prime spot where a large pool with some cover shouted "BIG FISH!!!" at me. Sure enough, on the second cast a big brown shot out from under the rocks to chase my streamer. Right at the last second it gave up on the fly, and I was left staring at the spot it materialized from and vanished back to. Moving upstream, I continued to find a few nice fish. Finally it happened. I found one out looking for a meal and presented a small streamer. Carefully bouncing the streamer along the bottom, I saw the fish come over and inhale it. Soon I was taking pictures of a beautiful brown and was convinced that this was a stream worth returning to. David, beautiful Brown and great post. 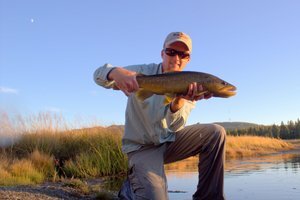 Gotta' love fall fishing and big Brown Trout. Looking forward to more of your tales from the water. Thanks Mel! I'm trying to make the most of my favorite season. Loved the post David. In one picture it looks like the brown is sticking his tongue out at you. 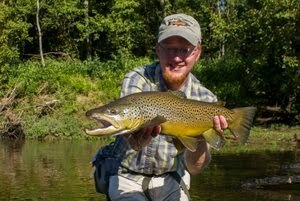 Nice river and amazing browns!